The 2017 Toyota Corolla helped make Toyota an industry leader in the most IIHS Top Safety Pick+ awards. The 2017 Toyota Corolla earned the top spot in the 2017 Top Safety Pick+ because of the ratings it earned during its crash tests. It amassed five good ratings in crash worthiness, an advanced or superior rating in front crash prevention and an acceptable or good rating for its headlights. It means that Toyota has invested in technology that is designed to keep you safe in most driving conditions. 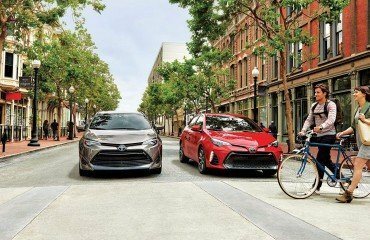 Toyota equipped all Corolla models with the Toyota Safety Sense™ P package that includes Pre-Collision Avoidance, Automatic High Beam and Lane Departure Alert. It also includes Dynamic Radar Cruise Control. The Pre-Collision Avoidance system has pedestrian detection, so it can tell you if someone has stepped off the curb into your path. The entire system is designed to detect an object, like another car or a pedestrian, in your path and brake to avoid hitting them. The Lane Departure Alert lets you know if you start to drift out of your lane by delivering an audio and visual alert. This departure system works with onboard cameras that can “see” white and yellow lines painted on the road and detect when you cross the lines without using your turn signal. If you opt for the Lane Departure Alert with Steering Assist, the vehicle will make small steering adjustments to nudge you back into your own lane. A backup camera is now standard on all Corollas but the CE. The camera is displayed on the 6.5-inch touchscreen mounted in the Corolla’s dash. The touchscreen monitor is also where you can make all of your entertainment choices. It includes an AM/FM/CD player with MP3 and WMA capabilities. It has inputs for USB and AUX jacks, so that you can connect all of your favourite devices. It also has Bluetooth® capability and voice recognition. You can keep both hands on the wheel and both eyes on the road and still command your audio system. SIRI Eyes-Free takes all of your voice commands and makes your mobile devices do your bidding. SIRI Eyes-Free is included on all models. Steering wheel-mounted controls also make it easier to keep your eyes on the road. You can make audio adjustments and operate your cruise control with a touch of a button. Other options include Smart Key technology and Push Button Start. The 2017 Toyota is safe and filled with the latest technology, but it is also fuel efficient and made to perform. All models are equipped with a 1.8L 4-cylinder DOHC engine capable of at least 132 horses. The LE ECO and the IM both have Valvematic Technology, and the other models are equipped with Dual Variable Valve Timing with intelligence. The Corolla is available in three trim levels with a number of packages for each level. The trim packages let you choose which luxury items you want to add to your Corolla. Options like leather-wrapped steering wheels and heated seats are some of the equipment that you can add to your model. No matter which trim level you choose, the 2017 Toyota Corolla is filled with many standard features that make this award-winning vehicle a popular choice with drivers. Toyota says that 85 percent of the cars sold over the last 15 years are still on the Canadian roads today. Stop by and test drive a new 2017 or 2018 Toyota Corolla and see why everyone loves their Toyota.